LAUNCH is an experienced company in automotive aftermarket, founded in 1992. Concentrated on the spirit of people orientation & the principle of Innovation, Quality, Efficiency, Profession and Competition. 12-month warranty for any quality problems. 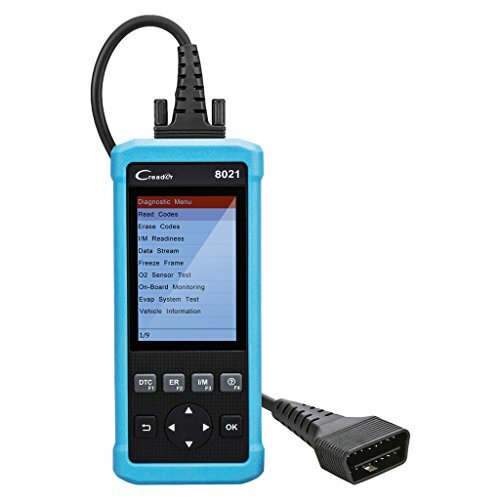 AMAZING OBD2 SCANNER - Provide full OBDII/EOBD diagnostic and reset functions, oil reset, EPB/BMS/SAS reset, can diagnose ABS and SRS system. FASTLY DIAGNOSE CAR CODE - The car code reader can high-efficiently clear vehicle error codes. With live vehicle sensors graphical data, MIL and I/M readiness state, that's easier to focus on suspicious or symptom-specific data parameters, help to find out what's wrong with your car. SUPPORT & SERVICE FEATURES - The scanner tool works on most 1996 US-Based and newer OBD II & CAN domestic or import vehicles. Multilingual Support- English, German, French, Spanish, Japanese, Russian and Portuguese. Besides, it covers 46 car models such as BMW, ACURA, HOLDEN etc. NO NEED EXTRA BATTERY - Power directly charge from OBDII car scanner interface in your vehicle. 4.0 inch TFT color screen and smart hotkeys make this automotive scanner become an ideal tool for professional technician who do car maintenance work at home, also makes it convenient for DIYers and personal diagnosis. 100% MONEY BACK GUARANTEE - Life-Long Free update online with professional customer service. Hassle free 1-year replacement warranty if any quality problem. No Questions Asked.